Experience the Ultimate Market Positioning Event for Yourself! Learn How to Position Yourself as The Go-To Expert in Your Niche Market and Move Miles Past Your Competition! Join Us LIVE for an Amazing, Information Packed 3-Day Workshop … and Discover Why Attendees Return Time & Time Again! Discover a PROVEN BUSINESS BUILDING STRATEGY and a Step-by-Step Action Plan to Build a 6-7 Figure Financially-Free Expert Business on Your Own Terms! Gain the confidence, clarity, focus and direction you need to start playing a BIGGER GAME in your business and every part of your life. If You Are NOT Embracing the Latest Education-Based Marketing Strategies … You Are Either Falling Behind in Your Business or Losing Ground Over Your Competition! Here’s What You’re Going to Learn! Before you can upscale your business to expert status, you must first build or reinvent your brand foundation. If you don’t have a solid foundation in place, you won’t be able to upscale and position yourself for high-paying clients. Does your brand showcase you as The Go-To Expert in your industry? Does it reflect top value and high-dollar worth of your services? And does your website, social media pages and copywriting come across with clarity and a high level of professionalism in your prospect’s mind … in an instant? At this workshop you will discover the POWER of an expert brand, and a PROVEN step-by-step marketing strategy that will show you exactly how to up level your own branding. To gain high-paying quality clients in your market, you must be positioned as the best-of-the-best within your industry. Showcasing your value, benefits, knowledge, uniqueness and expertise in your market positioning will move you miles ahead of your competition. Discover how to make more sales with ease by learning how to Educate-to-SellTM your services and products. Get booked to speak often as The Go-To Expert. Get in front of your ideal target market and have prospects clambering to buy from you after you present. At this workshop you will learn how to easily gain the top clients in your market who value your advice and pay you top dollar for your skills, services and expertise. Imagine turning your ideas, passion and talents into BIG MONEY. YES! This is the event where you discover the strategies on exactly how to make a ton of money as a highly paid expert — creating a Business Freedom Lifestyle on Your Own Terms! You will learn how to generate more money hosting your own successful event in one weekend, than most people make in an entire year! Knowing how to package your expert services effectively and having the skill to sell them effectively will be a game changer for your business income! You’ll learn how to package your expertise and services together to create high-paying VIP days, coaching and consulting programs around what you already know. This event is interactive and fun and is designed to give you exactly what you need to grow your business! What makes this workshop so unique is that you actually get the work done while you are here! You will walk away with an ACTION PLAN in place to hit the ground running! In fact, you’ll see RESULTS by the end of the first day when you create your own Multiple Income Streams Business PlanTM and your own Quick Cash FormulaTM. Attendees of this workshop have easily doubled, tripled and even quadrupled their income in a matter of months from Debbie Allen’s personal training and business mentoring. This is the weekend that you will experience her powerful Expert Positioning FormulaTM that has helped hundreds become highly paid experts. It’s time to get really SERIOUS about stepping your business up to a much BIGGER GAME! 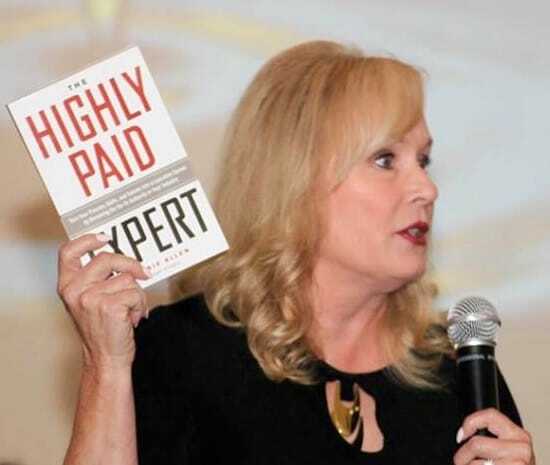 Debbie Allen is one of the world’s top business and brand strategists with over 20 years of experience as a highly paid expert, business mentor, professional speaker, and bestselling author of 8 books. Debbie has been a highly successful entrepreneur since the age of 19, and was a self-made millionaire in her early 30’s. Since the, she has trained and mentored thousands of clients from around the world in diverse industries helping them quickly become financially-free entrepreneurs and highly paid experts in their niche market. Debbie’s students include entrepreneurs, small business owners, coaches, consultants, speakers, authors and experts in diverse industries. Dramatically increase your income and get paid what you’re worth. Get focused, gain clarity and dominate your competition. Design a Highly Paid Expert Model that will position and leverage your target marketing so that you easily gain the most ideal clients. Develop a lucrative career that you love, and a business model that impacts the lives of others at the same time.